Video games are a waste of time for men with nothing else to do. These days, mountainous-haired carrot-top Conan O’Brien seems to be taking a lead from Jimmy Fallon, who replaced O’Brien on NBC’s Late Night back in 2009. Conan went on to host the vaunted late night talk show The Tonight Show, a run that only lasted months. Fallon himself has since been tasked to take over The Tonight Show when current host Jay Leno steps down, perhaps even permanently this time. Anyway, this post isn’t meant to dwell on the revolving-door morass that is late night television in America. It is meant to point out that O’Brien himself has started to mine video games for comedic value, much like Fallon has pretty much from day one. Fallon played Wii games on his show when Nintendo’s revolutionary console came out, and has featured other popular games in front of the camera. This focus on video game playing by late night hosts seems on the whole to be tapping the popularity of “Let’s Play” videos of game play that litter YouTube and twitch.tv these days. Germain to this site, O’Brien featured a “Throwback Edition” of his Clueless Gamer segment last week, playing games from the Atari 2600 library. Among the savaged product was the big kahuna of awful classic games, the impenetrable E.T. The Extra-Terrestrial, a game so dense and confusing, and with such high-hopes pinned upon it at release in 1982, that its abject failure was one of the reasons the entire video game industry cratered in 1983-84. This entry was posted in 1977, 70's, 8-bit, 80's, Atari, Conan, E.T. The Extra Terrestrial, Pitfall, tv, VCS/2600 on August 13, 2013 by William. The 12 Video Games of Christmas: Pitfall! Leaping into The 12 Video Games of Christmas today is Pitfall Harry, in a drastic iOS remake of Activision’s original 1982 Atari VCS/2600 game Pitfall!, by developer The Blast Furnace. 30 years after the fact, this new version almost seems like a retro-themed version of the hit mobile game Temple Run. 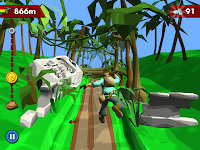 Here we send Harry running pell mell through 3D-rendered native villages, cavernous er… caverns, and wild jungles. Obstacles in his way must be jumped over, slid under and, in the case of the snakes and scorpions that return from the original, whipped with an accessory borrowed from Pitfall Harry’s original influence, Indiana Jones, all the while snagging treasure that lines the paths. Solidly falling into the Freemium category of apps, here the in-game currency are diamonds and the treasure you find, which you use to upgrade Harry with more skills, or even just to continue the game where you left off. Given the breakneck, twitchy gameplay, you’ll be dying a lot, and since diamonds are given out sparingly by levelling up, you’ll be feeling the pull to purchase a bunch, ranging from $1.99 all the way up to $29.99. It’s feasible that you could plow through the game without actually spending a cent, but only for the devilishly patient gamer. A very nice touch of nostalgia are the “Explorer Club” badges you collect in game by reaching achievements; a nice throw-back to the real badges Activision would send to players who mailed in proof of their accomplishments. 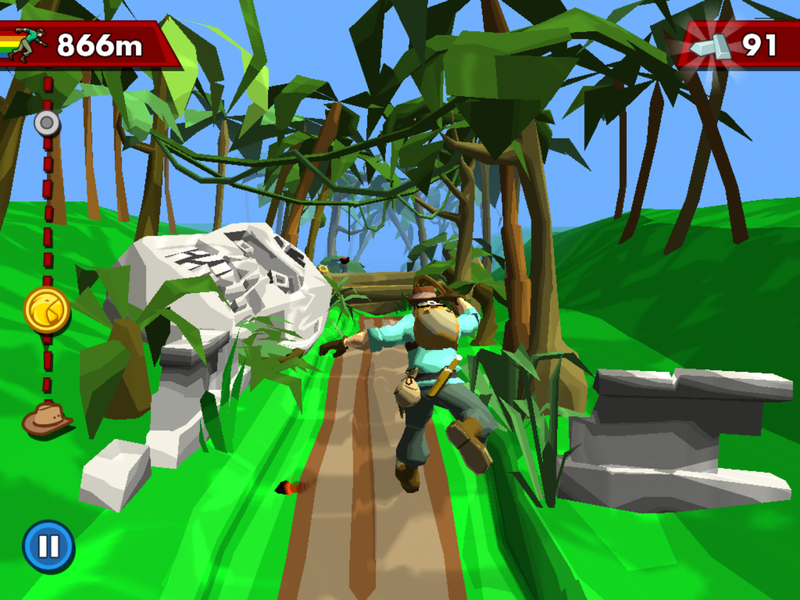 It’s good to see Harry back, even if he’s aping another gaming app like Temple Run. Swing on over here to continue his scorpion dodging exploits on your iOS device. This entry was posted in activision, adventure game, iOS, mobile gaming, Pitfall on December 21, 2012 by William Hunter.